We are all aware that poker is a game which involves strategy, instinct and experience. The combination of these three traits can often make a massive difference between a substantial win and a frustrating loss. However, there are still instances when you will be playing with little knowledge of what the others may be holding. The most common example of this situation is known as a poker blind. Let us take a look at the basic concept behind these positions before moving on to how you can leverage your holdings in order to increase the chances of coming out on top. What Are Online Poker Blinds? Poker blinds occur when playing Texas Hold’em. Two players are normally seated to the immediate left of the dealer. Before any cards will be dealt, these players will be required to place two bets. The term “blind” is used because no one knows what their upcoming cards will be. The main point behind blinds is that participants have already placed some money in the pot. This money can then be transferred into potential winnings once the first hand has been dealt. When playing online blind poker, there are two separate categories to appreciate. Let us now look at each in greater detail. In order to know how to play blind poker, you will need to know the difference between a big blind and a small blind. The majority of Texas Hold’em games will see the first player to the left of the dealer place a small blind. This blind is generally the equivalent to half of the total pot. The following competitor will then place a big blind (this is the full amount for the given round). While this seems rather simple, there is a bit more than meets the eye in terms of when each should be leveraged. 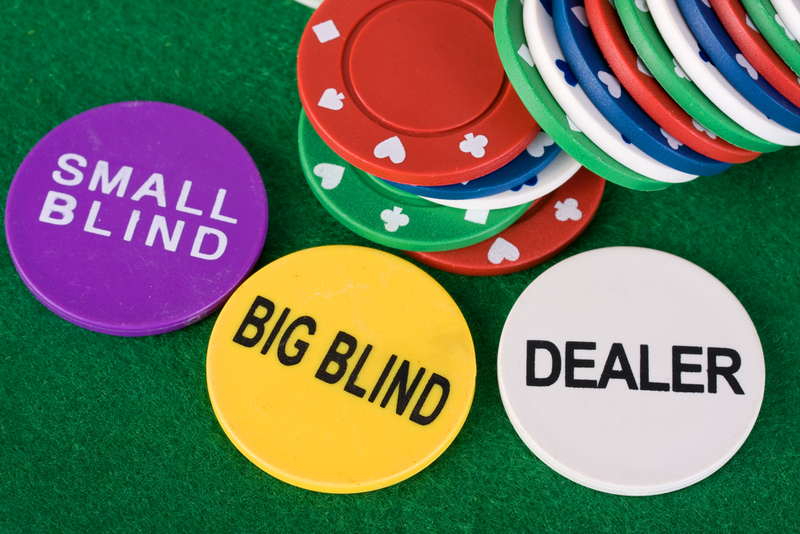 In terms of small blinds, the player has the distinct advantage of being able to see the current flop for a fraction of what the big blind player has contributed. So, it is normally wise to see the pot (assuming that no raise has occurred) with hands such as queen-10, jack-10, king-8 and so on. Having said this, some of the best players in the world find that it is difficult to win within a small blind. In other words, the player is out of position. This is why the main intention is to minimise losses. Such a strategy will enable the competitor to maximise the wins associated with different seats. However, we should also mention that those entering into a small blind with a powerful hand might very well be able to call. It is nonetheless a fact that adopting a conservative strategy tends to pay off in the long run. So, be sure to tighten your starting hand requirements to mitigate potential losses. The main advantage of the big blind is that players will be able to check and see the flop without having to place any additional funds into the pot. This can be a powerful strategy; particularly if the player possesses a hand different to those mentioned previously in the article. Still, a few hands should always be associated with a raise. Examples include ace-ace, ace-king and king-king. This is assuming that more than two players have already entered into the pot. To put it another way, it might be better to disguise a hand at this early stage. This will help to minimise the chances that another player who has limped in will suddenly be dealt a card to complete their set. The benefit here is that if everyone else folds, the player will receive the big blind back as well as the small blind. Many believe that either blind tends to be associated with a losing position. However, this is not always the case. It can be argued that knowing when to fold and knowing when to call are the two most important takeaway points. Still, developing the ability to read other players as well as to know your chances of obtaining a wining combination are just as important if you hope to master these two blinds.